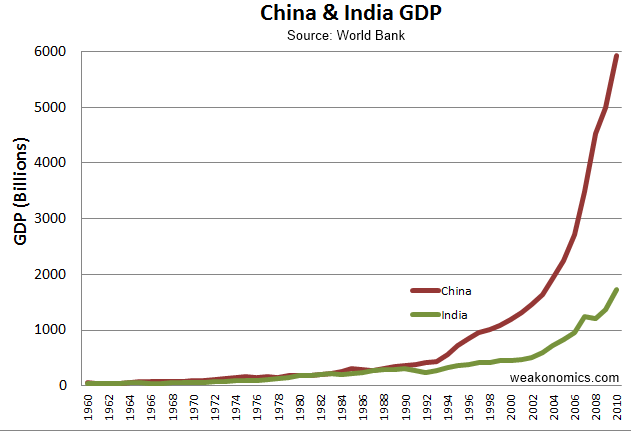 Haq's Musings: Indian Economic Miracle is Deceptive! Some urban middle class Indians often leave comments on this blog citing their country's ranking relative to Pakistan's on a contrived index called "Prosperity Index". This index is published by Legatum and reported by Forbes magazine, a publication of the rich for the rich and by the rich that focuses exclusively on the world's multi-millionaires and billionaires as its key audience. The producers of this "prosperity index" are part of the elaborate deception being perpetrated about India that is hurting its largest population of poor and hungry who are faring worse than the poorest of the poor in Africa. The real number is probably even larger. The recently launched M ultidimensional Poverty Index (MPI), a more comprehensive measure of deprivation than the current “poverty line” of $1.25 per day, uses 10 markers of well-being, including education, health and standard of living. The MPI, developed by the Poverty & Human Development Initiative at Oxford University, puts the Indian poverty rate at 55 per cent. That’s 645 million people — double the population of the United States and nearly 20 times the population of Canada. A much better measure of the average Indians' situation is the multi-dimensional poverty index recently published by Oxford University researchers. While OPHI's MPI is a significant improvement over the simplistic income level criterion for assessing poverty, it appears that the MPI index gives nearly three quarters of the weight to child mortality and school enrollment, and just over a quarter of the weight to a combination of critical factors such as access to electricity, sanitation and clean drinking water which are essential for proper learning environment, increased human productivity and healthy living. BRIC, Chindia and the "Indian Miracle"
So what we can infer is India is overall superior to Pakistan in the human development index as seen by the higher rankings. Pakistan is ahead in two indices of the many which constitute HDI which India due to its high growth rate is almost sure to overtake given pakistan's political instability and economic stagnation. It is true that India with its democratic system of painfully slow decision making and legal system, could not match the big strides that China made, with its authoritarian system of governance. None the less, India is on a roll. It is not if but when things will change for the poor and deprived in India. And as far as Pakistan is concerned, it is fast losing its relative strength to bargain with India on all issues, and a few decades down the road, will be totally irrelevant. Therefore, I see no reason for the Pakistanis to seek satisfaction out of the statistical data of what India is achieving or not achieving. So by this article's logic The United States of America is worse off than Paraguay as there are in absolute numbers more poor people in US ghettos leading miserables lives than the entire population of Paraguay? anon: "China is worse off than Pakistan because with 1.4 billion as the base it has more people living on less $2/day than Pakistan...Brilliant analysis but wasn't expecting much more from a tabloid"
India has more poor people in absolute numbers and as percentage of its population than either Pakistan or China, acccording to UNDP and Oxford reseachers data. india's economic miracle is real enough for the US to consider it a source of jobs in 2010. 'India will follow its own strategic and diplomatic interests – which are not synonymous with those of the United States. more impotent rage from citizens of an erstwhile great power (UK). The British can't stomach the fact that their one time colony now as a bigger navy than the once mighty Royal Navy and will surpass them economically this decade and matter a lot lot more in the world than they will so they keep printing this sort of rubbish. As for Kashmir?What about Northern Ireland the British have much less of a right to be there than we do in Kashmir.It is a catholic majority region which according to most opinion polls want to rejoin their kin in the rest of Ireland.Why no referendum in N Ireland ? Two Indias? What about the british class system(the only one in the first world)? Atrocities?Human rights?What about the late victorian holocausts which killed about 40 million colonial subjects.I somehow don't recall an official apology? But anyway the British aren't of much use to India anyway I mean seriously what can they offer that US/Russia/Israel/Japan can't? Infact there are serious proposals of merging UK and France's seats into a single EU seat and offer the vacant seat to India.Unlikely but would more accurately refer to the emerging world order than the one in 1945. Giant with feet of clay?? That probably explains 10% growth. Duh! Agni 3 is a 3500km range single warhead missile can only cover most of China from near the border. Agni 5 on the other hand is a 5000km MIRV(6-10 warheads)missile which can cover most of China from deep inside India. Obviously range is inverse to payload so Agni 5 with one single warhead will effectively be an ICBM. And what rage in the muslim world? ?Except Pakistan I can't find any muslim country upset over the nuclear deal a very wise and productive move by the US. While the western media fulminates against Taliban’s or Iran’s treatment of women, a leading British medical journal reports an estimated 40,000 Indian women are burned alive each year by their in-laws to grab their dowries. Yes 'British Medical Journal' and 'estimated'.It is also estimated that upto 50,000 married british women are in abusive relationships and are regularly assaulted by their husbands. The poor miserable Indian has hope. None for the Pakistani. What are they going to do? anon: "The poor miserable Indian has hope. None for the Pakistani. What are they going to do? " You want to talk about hope? The 7000 Indians who have aleady died evey day of this year have no hope. In fact, a child in a poor country in Africa has more hope than a poor child in "Shining" India. Due to the fake ‘India Shining’ propaganda, foreign donors are reluctant to help the poor people in India. According to figures provided by Britain’s aid agency, the total aid to India, from all sources, is only $1.50 a head, compared with an average of $17 per head for low-income countries. And aid to India is being reduced as we speak with the British budget cuts. By that logic Riaz since Pakistan is economically in a far more precarious state,it should stop its we are equal if not better than India rhetoric and portray itself as an international basket case to garner more international support and much needed aid. The upper caste Indians are among the most capable in the world particularly Brahmins who I observe to be disproportionately more represented in white collar jobs to their 3-4% demographic they are kind of like the Jews of India.The trouble is the Upper caste make up only 15-20% of the Indian population.After this the capability falls off a cliff. Funny the above mention the US because the US is by far the most unequal developed country on the planet with the top 1% owning 30% of the nation's capital stock and third world levels of inequality as reflected in the gini coefficient of 46.8 much much higher than India. anon: "Funny the above mention the US because the US is by far the most unequal developed country on the planet with the top 1% owning 30% of the nation's capital stock and third world levels of inequality as reflected in the gini coefficient of 46.8 much much higher than India"
But the US has a very good basic social safety net that protects people from the kind of deprivation and starvation that claims 7000 Indian lives every day, and makes India home to the world's largest population of poor, hungry and illiterate people.